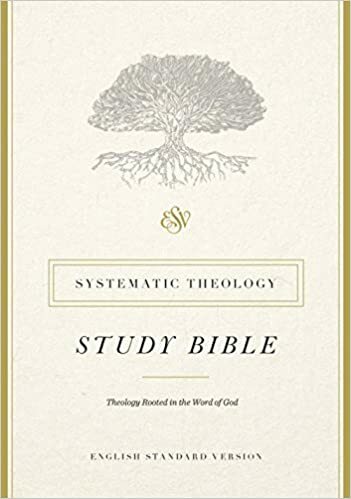 March 13, 2017 October 20, 2017 / J.K.
ESV Systematic Theology Study Bible – New from Crossway , coming some time in the Fall. The latest date I’ve seen is October 21, 2017; however, it has already moved once as far as I can tell. You know I’m big on Study Bibles, and obviously adding Systematics is going to be big for me. I plan on getting this as soon as I can, hopefully before it is published. I’ll keep you updated on what I know. Update – Looks like all editions (Hardcover, Leather, fake Leather) are going to be available 10/31/2017. That is the 500th Anniversary of the Reformation starting (Luther nailing the 95 Theses). I won’t be buying the hardcover, I tend to favor the fake leather, but I can’t quite tell what the design looks like. May actually splurge and get the real leather. Theology nerd Ryan is geeking out about this!! !